Angkor Wat Archaeological Park, with its stunning temple ruins dating back between the 9th and 15th centuries, is considered a bucket list travel destination for travelers all over the globe. It’s #1 on TripAdvisor’s 2015 Travelers’ Choice list for the top landmark in the world to visit. The 400 square kilometer temple complex became a UNESCO World Heritage site in 1992. 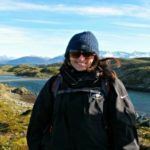 It has gone from attracting just thousands of visitors each year to welcoming millions of sightseers! Chances are you’ve traveled a long way to see the temple complex! 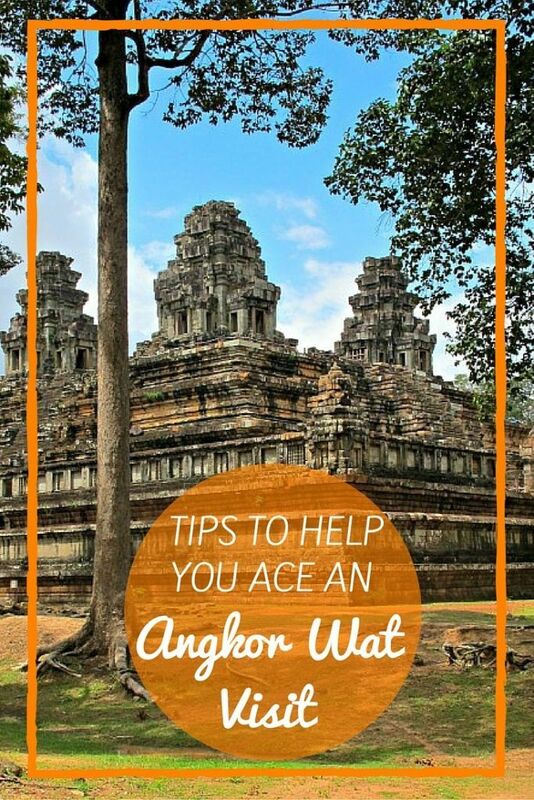 So, here are tips to help you ace an Angkor Wat visit. Should I rent a tuk-tuk or a bike? 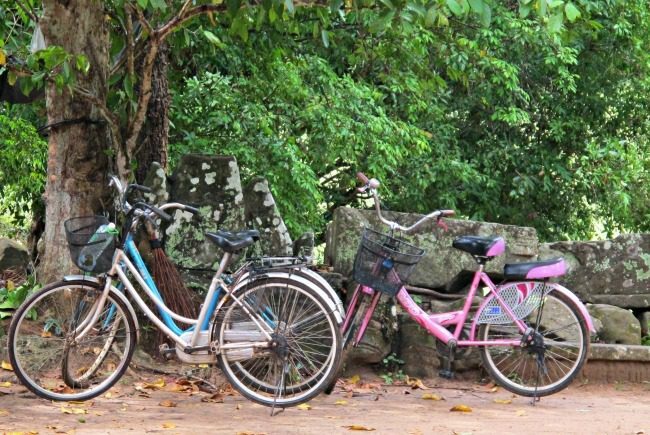 From your accommodations in Siem Reap, and aside from a large tour bus, you have 2 main options for visiting Angkor Wat and the surrounding temples, tuk-tuk or bike. Yes, both are widely available. Bikes are cheaper for sure…but, honestly, I couldn’t believe it when I saw people riding bikes! Call me a wimp, but there is no way I’d bike to the Angkor Wat temples in 100-degree heat! Cambodia is the HOTTEST place I’ve ever experienced. Seriously, it’s the sun on steroids! Temperatures are rarely below 80 degrees and are typically up in the 90-105 degree range. It’s not a dry heat either. You are hot and sticky all-of-the-time because the humidity is easily 100%. The people I saw riding bikes were red-faced from the heat and sporting (un)healthy sunburns. Ok, to put this in perspective, Angkor Wat is a few miles from Siem Reap. From there, temples are spread out across deceptively long stretches of road. Obviously, there’s the ride back to town when you are done for the day. All of this exertion doesn’t include the climbing at each temple. There are flights of stairs, often requiring hands and feet to climb because of the steepness or wide space between steps. Unless you are in extremely amazing shape and think hot yoga for 7-8 consecutive hours sounds awesome, hire a tuk-tuk! Feeling the wind from the tuk-tuk revived me between temples! I give those girls sooo much credit! Hotels and guesthouses have tuk-tuks on standby outside. 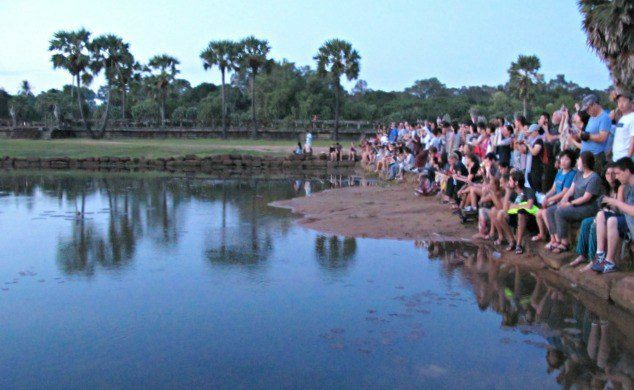 They can be hired for as little as $15 a day to see Angkor Wat and the temples nearby. To see temples further out, like Banteay Srey, the Roulous Group, and Beng Mealea, prices can vary between $20-$35 for the entire day. 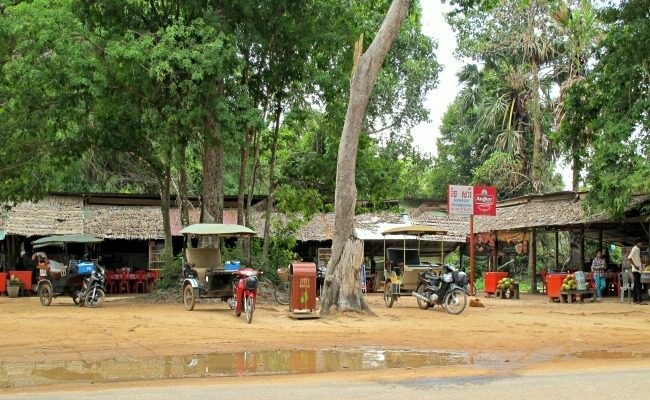 Guides can also take you out to the countryside to places like Phnom Kulen where you can see and experience authentic Cambodian life. Beng Mealea has been completely taken over by the jungle. It’s worth the longer tuk-tuk ride to see these ruins. Guides there will charge $2 to help show you the way as you climb through the rubble. TIP: Be sure to communicate with your driver about where he’ll be waiting for you. Some temples have different entry and exit points. Maps are not helpful because many of the temples have numerous passageways to walk through. It’s easy to get turned around and not remember where to go. Knowing whether it’s the north or south gate is crucial to avoid long walks from gate to gate to find your tuk-tuk. Should I buy a 1-day or 3-day Pass? A 1-day pass to the Angkor Wat Temple Complex costs $20. A 3-day Pass costs $40. If you are not into history and ancient ruins, a 1-day pass might be enough for you. 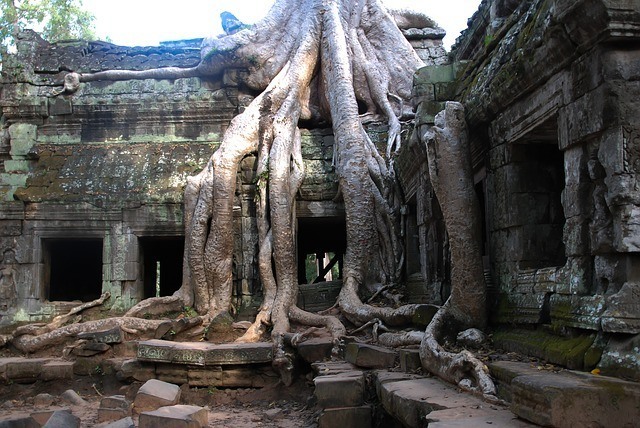 Ta Prohm was made famous after the movie Tomb Raider, starring Angelina Jolie, was shot here. 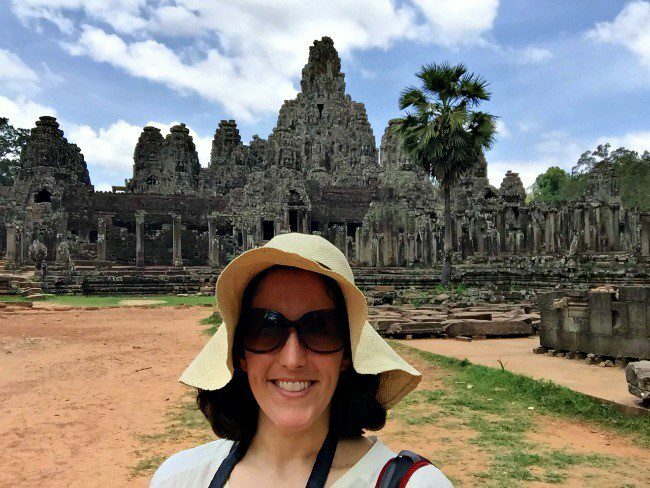 If you plan to visit more than just Angkor Wat, the Bayon, and Ta Prohm (and you should explore more than these 3! 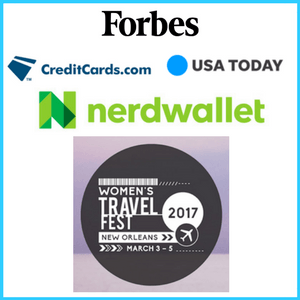 ), buy the 3-day pass. Some of my favorite temples, like East Mebon, Banteay Srey, and Beng Mealea, were the ones I saw on the 2nd and 3rd days! Another perk to venturing away from the more well-known temples is seeing the countryside. 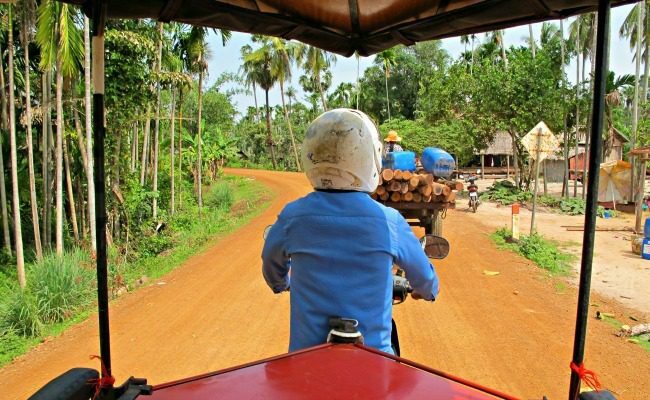 This scenic dirt road, perfectly terra cotta in color, drove past real Cambodian life. Temple fatigue is real. If you try to race through too many temples in a day, you won’t know what you’re looking at after a while. The heat is also no joke. It can sap you of your energy making it nearly impossible to enjoy the ruins. An important thing to note as well, a 3-day pass is good for a week’s time period. This means you don’t need to do 3 consecutive days of temple visits if you have extra time in Siem Reap. I had a fantastic stay at the budget-friendly Golden Temple Villa. Search and book more great hotels in nearby Siem Reap on TripAdvisor or Booking.com. When is the best time of day to visit the temples? Morning. No! Early morning is best. Seeing the sunrise over Angkor Wat is a must. Angkor Wat just before sunrise. This means a 4:30 a.m start to arrive in time to find a good spot in front of the crowd. 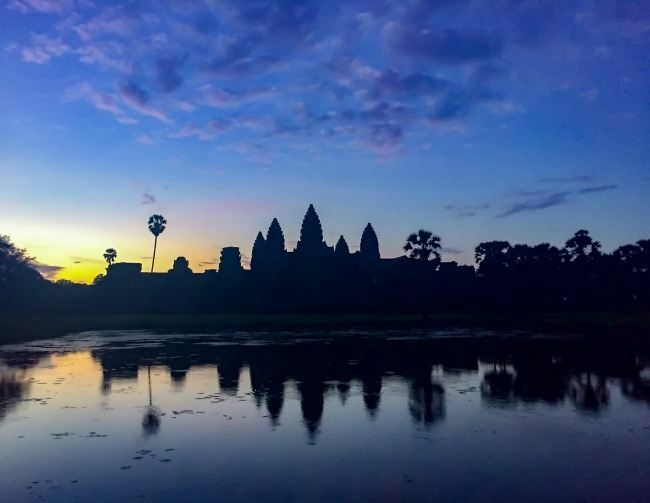 There are hundreds of people each day who head to Angkor Wat for the sunrise. Plan to leave your hotel at 4:30 a.m. TIP: Wherever you stand, be sure it’s at the foot of the water. If there is even an inch of space between you and the water, you can bet someone will try to stand in front of you! Once you get to your spot, don’t move until you’ve captured all your shots. Chances are you won’t be able to return to that spot. If you’ve seen the sunrise already, still plan to start your days as early as you can. The park opens at 5:00 a.m. so set your alarm and get going! 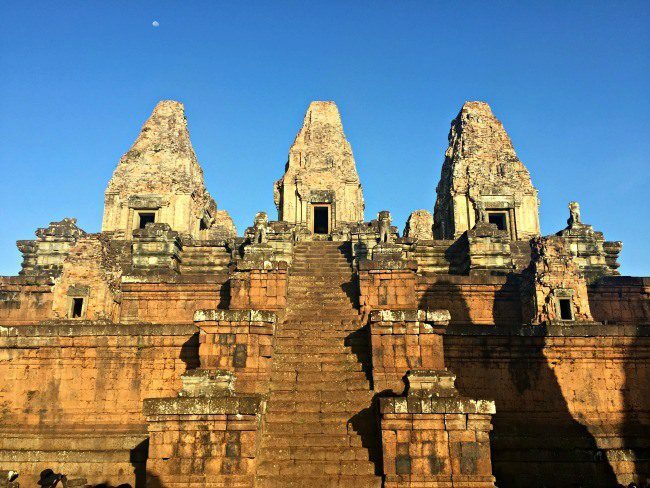 The early morning sun reflecting off East Mebon with the moon still overhead was beautiful. Even better, there were only a few people visiting this temple so early! Mornings are “cooler,” with the searing sun not quite at full strength yet. Avoid the crowds! Fewer people (relatively speaking) will be out in the early morning. You might even ask your tuk-tuk driver to visit the circuit of temples planned for the day in reverse order. You’ll end up avoiding the large tour bus groups going from one temple to the next. You can hire a local guide by reserving one in advance or by hiring one at the entrance to the main temples, like Angkor Wat. Tripadvisor lists plenty of highly rated tour guides. You could learn more about the history and facts of the temples. Keep in mind, though, guide fees are in addition to the price set between you and your tuk-tuk driver for transportation. If you don’t rush and spend time really observing the temples, you can actually learn a lot. A little research before and after doesn’t hurt either! The answer depends on your budget and how in-depth you would like to go in learning about each temple. I found that by reading a bit ahead of time and reading about the temples after seeing them, I learned a lot about the history and architecture. First and foremost, it’s important to remember these are temples. They are former places of Hindu and Buddhist worship. Dress appropriately. Temples require long pants or a long skirt and covered shoulders. You should plan on wearing sturdy shoes like sneakers or sports sandals. Climbing can be difficult with flip-flops or basic sandals and downright slippery during and after an afternoon downpour. Bring a hat or something to shield you from the sun. It’s unrelenting! There aren’t (m)any shady spots to take cover while exploring the ruins. I packed my hat and it quickly became indispensable! It wasn’t always a pretty sight, but this hat was a lifesaver! Plan to carry a backpack or small bag. You won’t want anything too heavy, but you should definitely plan to carry water, snacks, and extra sunscreen. TIP: Other items to consider carrying…hand sanitizer and toilet paper or tissues, for obvious reasons! Yes. There are likely to be groups of other tourists around and many of the temples have security guards. As with any place, it’s important to be aware of your surroundings. While visiting Bakong, I found myself at the top of the temple, with a local woman who at first appeared “official”, but wasn’t, eyeing both my camera and iPhone. I simply trusted my gut that this woman wasn’t entirely on the up and up and headed back down the Temple. A potential headache avoided. Roadside stands are set up outside every temple. People shout at you to buy food, drinks, and souvenirs. Around the temples, expect to find many Cambodians trying to sell you cold drinks, guidebooks, and other souvenirs. It was especially hard to turn away the countless children shouting “Laaaadddyy! You buy 10 postcards for $1?” They were persistent, even walking alongside me to my tuk-tuk counting out each of the 10 postcards one-by-one, but never threatening in any way. So, what have I missed? What are your tips to help ace an Angkor Wat visit? Great Post. Haha those kids are relentless. I felt bad and bought a magnet from one of them and got swarmed by like 10 more kids. Thanks for checking out the post! Yes, I almost crumbled too and bought some postcards but, exactly as you describe, I saw several others eyeing me up ready to swarm if I pulled out my money. I remember on our 1st day, it was so hot I felt ill. The next day we went earlier with a lot of water, and it was much better, plus it was not nearly as humid. Yes! I felt ill my 1st day in Bangkok because it was so hot! I agree though, lots of water and your body (somewhat) adjusts, which helps so much. Yep, I definitely wouldn’t bike there either, but a friend of mine absolutely loved it. I’d definitely rather go in a tuk tuk. Great tips! Thanks for sharing! I really give someone a lot of credit for biking through that kind of heat! Tuk-tuk is definitely my preferred mode of travel, though! Thanks Aileen! Cambodia has such a beautiful countryside, definitely have it on your list! It was hard seeing those kids, but I knew there were better ways to give help! 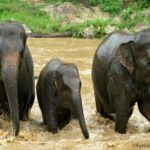 This is incredbily useful information for someone who is currently planning several trip, including another SE Asia vacation! 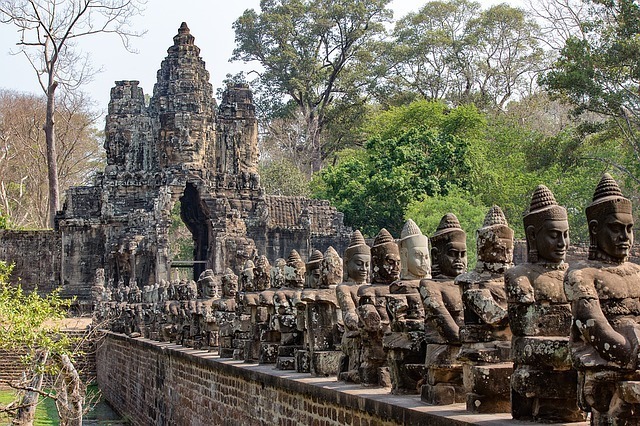 I’m dying to get to Cambodia and Angor Wat is at the top of the list. I’m with you, there’s no way I would bike there in 100 degree heat. To be honest, it could be a cool 70 degress and I’d still Tuk-Tuk it! Thanks Mia! I’m glad it’s helpful for you! I hope you can make it to Cambodia and Angkor Wat. The temples are spectacular and the countryside is unspoiled. I’m with you! Tuk-tuk it all the way! I spent my 30th birthday watching the sun rise at Angkor Wat. Such an amazing place. Great tips. That sounds like such an amazing birthday! I’m sure it’s something you’ll remember forever, Karilyn. What a fantastic guide! I don’t handle the heat terribly well so I won’t be riding a bike – which is a shame because I love bike riding! I’d love to visit here someday. I would buy the 3 day pass as I’d like to explore everything! Thanks Lauren! Angkor Wat is incredible…definitely a must-see. Such a shame because riding a bike through the Cambodian countryside from temple to temple does sound like such a great idea, in theory! Thanks Valerie! So glad it was helpful! I though the bikes were a good idea too! I was in Thailand first too, and the searing heat quickly melted that thought from my head! Hi! I totally agree with you – it get really hot around the temples. In Lonely Planet book, they advise to rent bicycle, but that is such a bulllshit:)) We rented tu tuk with three more friends and were really happy about our choice. Thanks for other tips as well! Well done! Thanks Veronika! I didn’t even realize Lonely Planet suggested renting bikes, but I’m not surprised. In theory, it seems like such a great way to experience the landscape…that is until you realize how HOT it is! This was a very comprehensive article! We live in Cambodia and have been to the temples several times. Biking is definitely not for the faint of heart! One thing I’d recommend is checking out Sras Srong Lake for sunset. Few people seem to go there for some reason, but the sunset reflecting in the lake is gorgeous! Great tips. I’ve heard how crowded Angkor Wat has gotten over the years so this will be very helpful to get the best out of this beautiful location. Thanks Jeh! Definitely go earlier in the day to avoid the crowds! 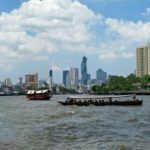 I’ve heard some of these but your pictures and tips about reversing order, getting to the waters edge and taking a tuk-tuk are going to help me immensely when I finally get there. Great work. Thanks, Elaine. Glad you found the post useful. Hope you make it to Angkor. It’s fantastic! Great tips! Definitely agree–tuk tuk is the way to go. Way too hot to enjoy biking around. Your sunrise at Angkor was way more impressive than mine…we had a dull day with no color whatsoever. Great photos! I can’t believe you weren’t hassled, Heather! I’ll watch out when I get to Egypt. Thanks for the heads up. I’ve never been to Cambodia but this is probably THE place in the world I would more dearly like to see: so beautiful and so interesting! I’m sure if I go there I’ll have my husband nagging to go by bike… I am saving your post for that moment 🙂 Thanks for sharing the beautiful photos and all the tips: now I want to go even more…. So glad to be your back-up on the bike debate, Marta! 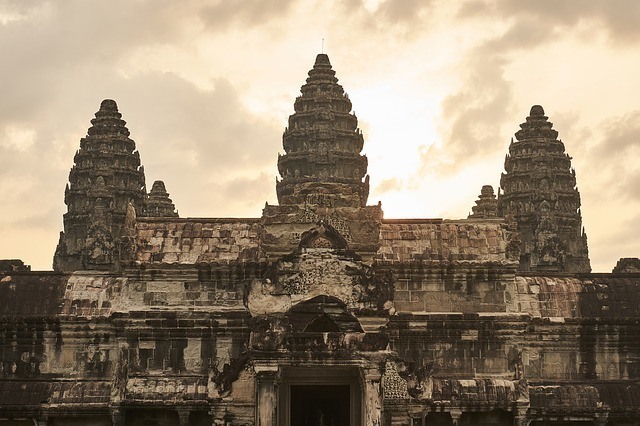 You’re sure to love your trip to Cambodia and Angkor. It’s beautiful. Great tips! I found that wrapping a wet, wrung out scarf around my neck really helped to keep me cool. Since we were visiting Siem Reap with kids, we opted for an air-conditioned van and a guide to take us around. It’s not the budget conscious option but still very cheap compared to what you’d pay for a private car and driver elsewhere in the world. The guide we had was certified, and I was impressed by how much training and testing they do to qualify for the certificate. I also felt bad turning away all those young kids selling items to the tourists. In advance, I had decided to make a donation to a Cambodian “orphanage” charity started by a friend-of-a-friend. I put “orphanage” in quotation marks because this charity actually seeks to keep impoverished kids with their parents and lift up the whole family to a better life. I should have absolutely had that wet towel, Michele! Good advice, for sure. So glad to hear that the “orphanage” you donated to was trying to help keep families together. Many people don’t realize how many kids are in “orphanages” who actually have parents who are just too impoverished to care for them. Okay I must be a total wimp because even the thought of a tuk-tuk was too much. Too hot and WAY too much dust. We organised a tour guide and driver for the whole time. It was an air conditioned car, cold drinks and cold wash clothes greeted us after every temple (and it was still hotter than hades). They drove us everywhere- to a dinner show, out to Tonle Sap to tour the villages, all of the temples. It was great and we thought great value. We used a local guide and driver and it was less than 1/3 what I was quoted by companies catering to western tourists for the same itinerary. Our guide worked for the international companies, we got him on his day off. Having a local was fantastic, we got to hear all the stories. When we passed a wedding he even shared the story of his own. That Cambodian heat is no joke, Elizabeth! No judgement here 🙂 Such a good point that the local guide was 1/3 the price of western tour companies booked ahead of time. There are so many drivers available that no matter where you stay you’ll be able to make arrangements to see the sights! Such a great “problem” to have, isn’t it Bea? 😉 I feel the same way! Glad the post was helpful. 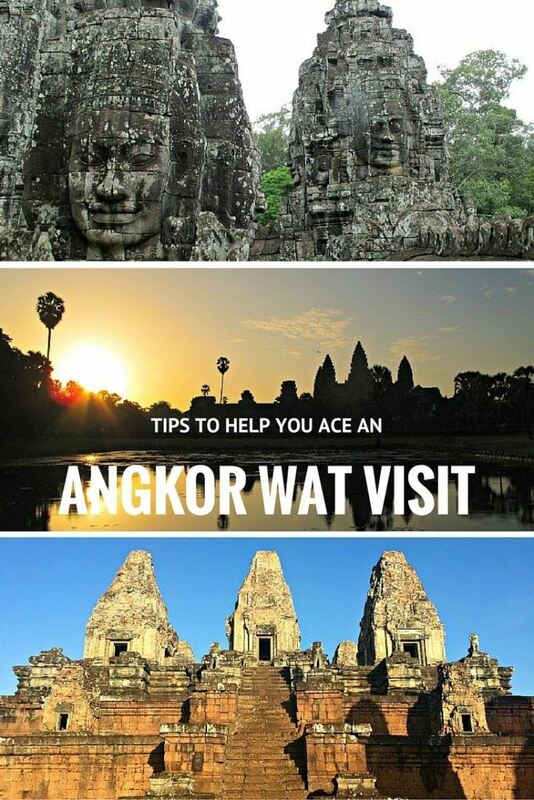 Hey Great Blog, I am off to Angkor Wat next month, I heard no need to book a tour or hotel in advance? Is that correct? Thank you, Arvin! Definitely no need to book a tour. There are drivers and tour guides readily available. Since I went in the summer months, I did book a place to stay ahead of time. I stayed at the Golden Temple Villa, a budget-friendly guest house and got a great rate per night. 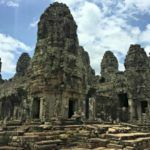 I would check on a travel booking website like Booking.com to see the overall availability within Siem Reap and to determine if you should book ahead of time or not. Great post! I’m finally going to make it to Ankor Wat with my aunt next year in April, and we can’t wait! 😀 We’ll definitely opt for the tuk-tuk – lol! Thanks for the heads-up about all the kids trying to sell postcards, etc. I imagine that the heat and humidity will feel like Japan in the worst part of summer…crazy hot with 100% humidity. Ive been to Angkor twice, during sunrise. Looking back now, i wished i had been there during sunset too, i think it would be magical. Good tips – but I have more of my own on my blog, like buying tickets at 5pm the day before. Cycling the small circuit is possible, I tried with the larger circuit and it took 8 hours and a tuk-tuk ride back from the last temple stop. From your post date, it seemed you went during the hotter and drier season during a year of drought. How great you’ve written about Angkor too, Nicholas. 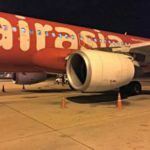 Unfortunately, my Air Asia flight arrived in Siem Reap after 9pm and there was no way to purchase tickets beforehand. Either way, it worked out and I spent 3 days exploring the gorgeous Temples. As for bike riding, good for you and anyone who wants to do that. 🙂 The heat of southeast Asia is too much for me to be cycling, drought or not drought. I loved reading your post. It was great!! Very useful tips… For sure I will hire a tuk-tuk !!! I like your post. I will be in Siem Reap next month. I will be there a very short amount of time though. I arrive at 11:00 am on a Wednesday and depart at 9:45 on Friday. What would you prioritize for itinerary while there? I don’t need to see only temples and want to see the town and some of the culture. Any tips are welcome. Thanks for reading, Traci. Angkor is really amazing. 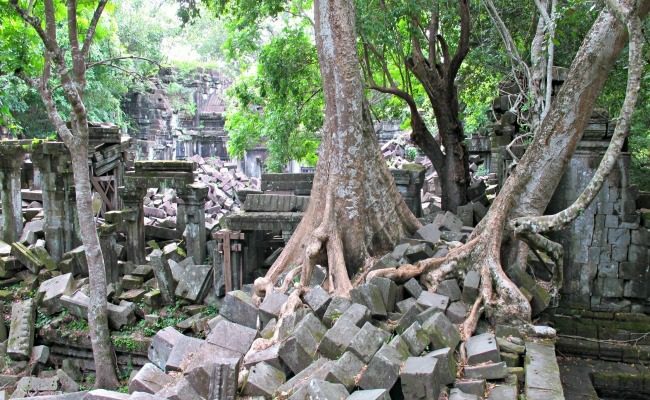 What could be interesting is to spend part of the time seeing some of the Temples further away from the main circuit typically done on day 2 or 3 of a 3 day Siem Reap visit. The reason being if you go by tuk-tuk, you’ll travel through the surrounding countryside with the chance to see daily life and the culture of the area. Beng Mealea was one of my favorites specifically because of the scenic drive to get there and the fact you can actually climb on the temple ruins which the jungle has taken over. 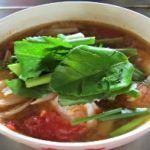 Pub Street and the night market in Siem Reap is a fun night out. But check out some of the teaching restaurants in Siem Reap, too. Great to support local endeavors. Happy travels!